As I have mentioned before, I am a massive fan of Triumph's 3-cylinder motors. Of all of the bikes on the market at the moment, I have always felt that the Triumph triple is the one with the most character to it; that unique exhaust tone giving it a very soulful sound. So when the opportunity arises, I never pass up a chance to take one for a ride. After coming back from my test ride of the Sprint ST, I opted to jump at the chance to test the 2010 Street Triple. For those who know Triumphs, the Street Triple is the little brother to the Speed Triple. It offers a smaller displacement triple motor out of the Daytona 675, giving it a power delivery characteristic closer to a 600cc super sport, but also enhances maneuverability due to the lower weight. It does not deliver the visceral punch of the Speed Triple's 1050cc motor, but offers a more user friendly package for those who cannot, or do not, use the extra power and acceleration offered in the bigger bike. Getting on the bike and lifting it off the side stand, the sheer weight difference between the Street Triple and its bigger brother is immediately evident. The bike feels considerably lighter when not moving, which should allow it to be much easier to handle at low speeds and would take much less effort to get it to turn. Thumbing the starter switch, that melodious idle from the triple wafted up to my ears. 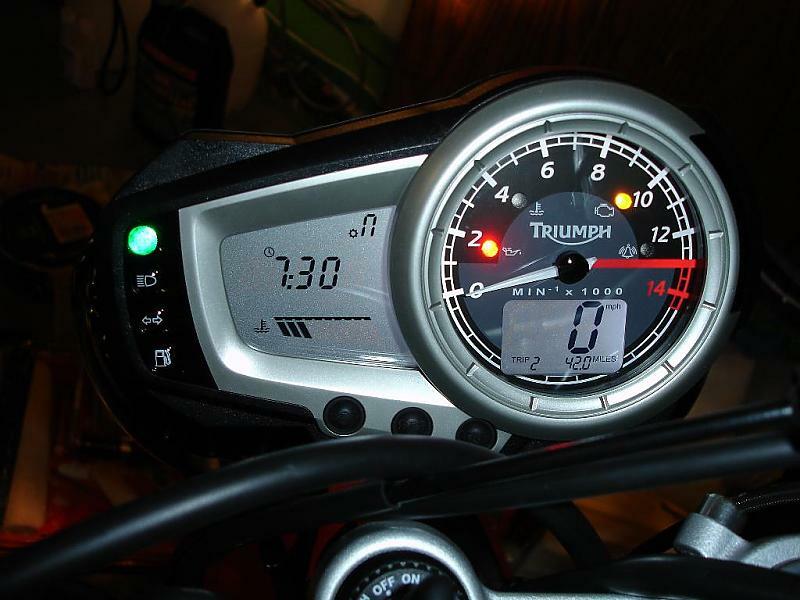 The instrument cluster on the Street Triple is simple and legible with its analog tachometer and digital speedometer. Giving it a couple of quick revs to hear the rumble of the exhaust, I set out for a quick stint. On the road, the difference in character between the 675cc motor from the Daytona is immediately evident, especially when riding the Street Triple back to back with one of the bikes with the 1050 cc triple. The power delivery of the two motors is dramatically different despite horsepower numbers that are not too far apart. Down low, there is not much torque so the 675cc engine needs a little more coaxing to really feel like it is in its power band. Running it up through the gears, it demonstrated a willing nature to rev, which meant one could get through the lull in the power pretty quickly. Once spooling beyond 5k rpm, there was plenty of power on tap and the motor really comes alive. Navigating the suburban back roads, it was easy to feel comfortable on the Street Triple. The bikes ergos are set up well with a relaxed riding position that only induced a slight forward lean, low-ish pegs to allow plenty of room for taller riders, and a relatively comfortable seat. Wide bars offer good leverage though the seat height feels a bit on the tall side for such a small bike. There are a lot of things to like about the Street Triple, but probably one of the characteristics that makes it such a great street bike is the handling. Many times, to make a bike less expensive, manufacturers choose inferior parts, but on the Street Triple, that is not the case. The frame and motor are essentially lifted straight from the Daytona sport bike. Mix in the greater leverage offered by the wider bars and the overall more upright riding position meant it did not take much effort to tip the bike into a turn. The suspension setup, despite no effort to adjust the preload, felt plenty quick enough and was stable through out corners, allowing one to hold a steady line with minimal adjustment needed. Large mid-corner bumps, however, would tend to upset the balance of the bike, and did introduce a little bit of wobble, but not so much as to be dangerous; just enough to be an annoyance when picking up the pace. Around town, the bike is wonderful. The fuel injection is good, without most of the surging that appears to still occasionally bother some fuel injected bikes. Power is adequate down low and downright plentiful up top, allowing for most riders to be able to find the right speed for their liking. And because the bike is so easy to handle, if you want to hoon around a bit, it is entirely too easy to do just that. The only thing that this bike does not offer, however, is wind protection. Getting it up to highway speed means putting up with a fair amount of wind buffeting and the tiny fly screen in front of the instrument cluster does little to divert airflow. Of course, this is to be expected of this category of bike. That said, for my money, I would look for a slightly older Speed Triple for the same price. The performance envelope gets expanded so much more and the usability around town from the 1050cc motor is significantly better due to the much greater torque. To me, the Street Triple just feels like it lacks a little bit of that Triumph magic that the Speed Triple has. It is still a wonderful bike, and I would highly encourage anyone looking for a naked to absolutely consider it. There are just some intangible qualities that make its big brother more appealing to me, but the Speed Triple is absolutely worth a ride if you ever get the chance.